We have a limited number of high end European Styled Outdoor Patio furniture settings direct to the public from our warehouse. These are high end wicker settings mostly supplied to property stylists that will make your space look like it’s straight out of a fashion magazine. We guarantee you will love Outdoor Patio Furniture Settings or money back. All our wicker settings come with a 2 year warranty. 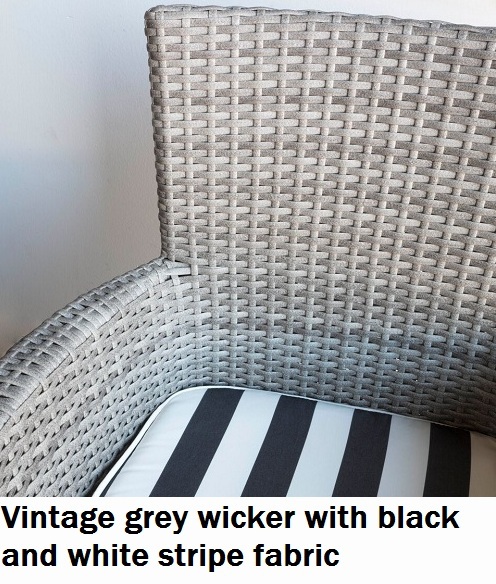 Our wicker settings are custom specified to the highest standards-many wicker settings are steel or aluminium requiring assembly rusting quickly and cushions that go flat as a crepe in a short time. Our wicker settings are toughened aluminium, welded then powder coated, require no assembly and comfortable high density waterproof cushions. UV resistant, colour, fast, stretch resistant and has inhibitors to prevent mould and mildew growth The cushion covers come off for cleaning and can be changed if you want a spare set in a different colour offered by us. Scatter Cushions pictured are optional and available in a range of colours for $20 each. IN STOCK NOW-WHILST STOCKS LAST ONLY.